Creating a blog website these days has become easy with platforms like WordPress. However once this is up and running, you have the next big challenge to increase your blog traffic to your website. No problem, you do not have to be a marketing guru to promote your blog. You can easily increase your blog traffic to get more visitors using some best technique. 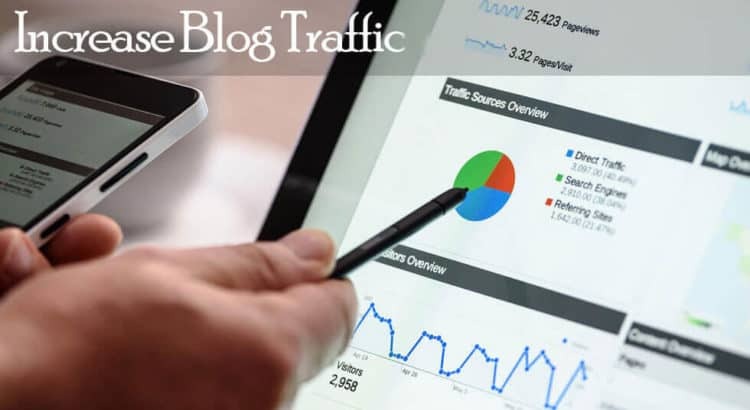 In this article, I will share some easy and tested tips to increase your blog traffic just like a specialist marketer. Unlike other articles on increasing blog traffic, we’re only going to share the suggestions we have personally used to increase our website traffic to unlimited of page views each month. Before you start writing content for your blog, it is important to spend a little time understanding your target visitors and what they are looking for. Who is your target visitor? What problems are they facing and how you can help? What type of content are they looking? How would they try to find the solution? Answering these questions will help you get a clear idea of your target visitor. Keyword research is a beast technique that is used by content creators and SEO experts. It helps find specific words and sentences that users type into Google and other search engines so that they can find the content they are looking for. Now the question is how do you try to keyword research? Fortunately, this is not as difficult as you think. There are numbers of free and paid tools that can help you do proper keyword research. Google Keyword Planner is one of the best free tools that can help you do proper keyword research. The most important thing that user and search engines look for good quality content. For a blog, a quality piece of content is usually an extensive article on a specific topic that contains all the details. It is extremely useful for users. As we mentioned earlier, search engines and users prefer long and extensive articles that provide all the necessary information. Here tips for making your content more readable and user-friendly. Use short sentences and paragraphs. It leaves lots of white space around the text, which makes it easy to see and read. Try to improve typography using simple, clean, readable fonts, big font-size and line spacing. Check the readability of your content. Yoast SEO plugin comes with a built-in tool, you can also get tons of other online readability checkers. Use a grammar tester. We recommend using Grammarly (https://www.grammarly.com/), it does not only check grammar but also helps you write better. Use pictures, screenshots, videos, infographics and other visual elements. These media elements make your article attractive and easy to read. SEO is a group of best practices that helps you make your website more search engine friendly. You do not have to become a SEO Expert to improve your website. Anyone can do SEO for their own websites without hiring a specialist. There are lots of SEO tools and plugins, free advice, and step-by-step tutorials that you can use. We recommend using Yoast SEO plugin for all WordPress websites for best result. Yoast SEO plugin is the most comprehensive SEO and Website Optimization tool. The free edition includes all the SEO features that you will need on your website. You can learn about all those who need to know about SEO, in our entire WordPress SEO guide for fresher. When users find your content in search results, they first see the title of your article. The title of an attractive blog post get more clicks. The title of an attractive blog post gets more clicks. Whereas a plain and boring title is ignored, and users are more likely to scroll by it. So headlines make very important part in the articles. You need to learn how to write better titles for your articles that catch user attention and get more clicks. Now that you have started making good content, it is very important to link your articles to your existing blog post. It is called internal linking, and it plays a big role in SEO. Internal links help Google understand the context and relation between articles on your website. Search engine uses this information as the ranking signals. Internal links can help you increase page views and reduce bounce rate. It is difficult to ask third-party websites to link to your article. Linking on your own site is easy. We recommend that you make a habit of linking your old articles with your new articles because internal links play an important role in SEO. A backlink is an incoming link to your blog content from external websites. Backlinks are among the most effective signals in Google’s ranking. Write guest posts on other popular blogs and websites. Add link to your blogs on all your social media profiles. Bad website design prevents users from spending more time on your blog, which reduces your page view. While a good design helps them find more content, explore different sections, and spend more time. A simple, clean and functional theme creates a good first impression and provides the best user experience. If your website is slow, users will leave your website before loading. Search engines like Google consider website speed and page load times is the most important ranking factors. To ensure that your website loads fast, you need to customize your WordPress website. HTACCESS file help to optimize your website. The issue with social media websites is that you have to post content regularly to keep your profile active and to drive traffic to your blog post. If you do this manually, you will spend a lot of time in sharing content. There are many free plugins available to automatically share your posts on social media. I hope this article helped you learn how to increase your blog traffic on search engine.